Do you know someone who’s passion is cooking? 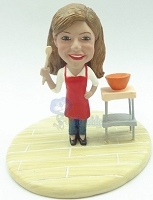 Show your Chef that you really care when you gift them an amazing Custom Made Bobblehead Doll that looks just like them. Whether you loved one is a Top Chef, Grillmaster or a clutz in the kitchen these delicious designs are the perfect way to show them you really care. Choose the body type and outfit that shows off your cook's unique style. Ordering from Webobble.com is always quick and easy, choose the perfect pre-made body, send in your photos and place your order. Then our artists go to work creating a beautifully detailed, Personalized Bobblehead Doll. You cook will love this amazing high-quality gift that’s sure to add sizzle to any occasion. Want a Head to Toe Custom Bobblehead Doll that's 100% them? Our highly skilled artists can easily create a Full Body Bobblehead that will delight and amaze everyone. Take a look at our Full Custom Bobblehead section. With more than a decade of experience and over 1250 5 Star Reviews, we truly are the authority on Personalized Bobbleheads so place your Custom Bobblehead order with confidence. All of our Dolls can be shipped anywhere in the world so send them a smile wherever they are.